What is IVR? The Interactive voice response (IVR) is a popular and widely used technology which allows a computer to detect voice and keypad inputs, so it makes possible the interactions between computer and humans through the use of voice and dual-tone multi-frequency (DTMF) signals. For illustrating the logical and physical structure of IVR systems are used the IVR diagrams. ConceptDraw DIAGRAM software extended with Interactive Voice Response Diagrams solution allows you to make the IVR Diagrams quickly and easily. 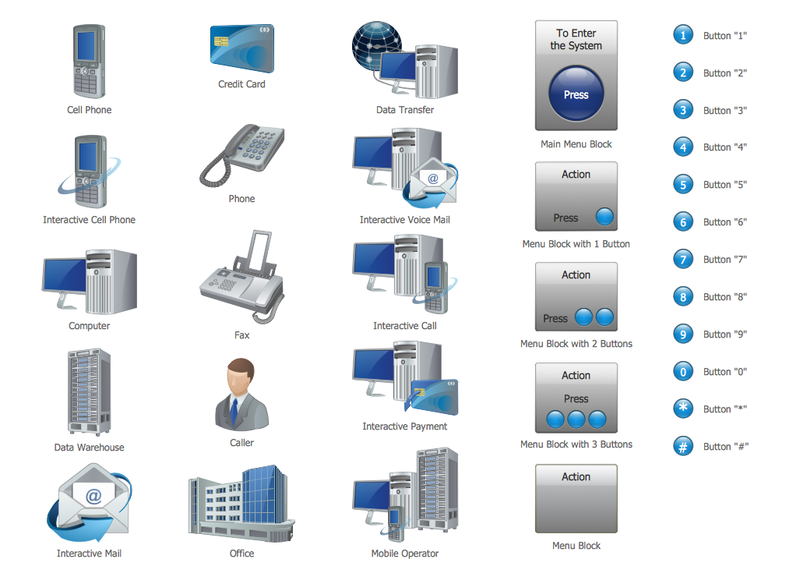 Interactive Voice Response Diagrams Solution offers a powerful drawing tools, the Interactive Voice Response library with predesigned vector shapes to make drawing the IVR diagrams easy for everyone. Interactive Voice Response Diagrams Solution provides also professionally designed samples and template. The IVR template offered by ConceptDraw DIAGRAM is already almost ready IVR diagram sample, you need only fill it with you data. Use the Interactive Voice Response Diagrams Solution for ConceptDraw DIAGRAM software to create your own professional looking IVR diagrams quick, easy and effective. All source documents are vector graphic documents. They are available for reviewing, modifying, or converting to a variety of formats (PDF file, MS PowerPoint, MS Visio, and many other graphic formats) from the ConceptDraw STORE. 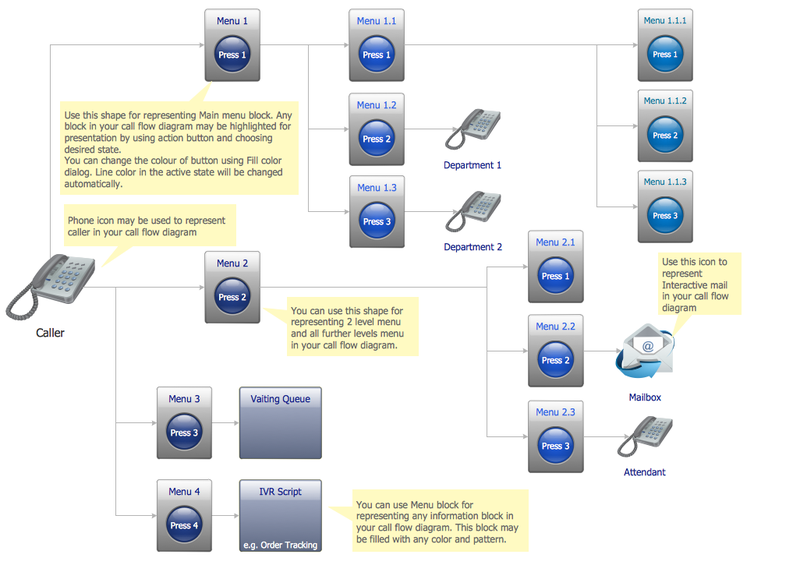 The Interactive Voice Response Diagrams Solution is available for all ConceptDraw DIAGRAM or later users. Interactive Voice Response (IVR) is a system of the prerecorded voice messages that allows a computer to interact with humans. IVR performs the function of the routing calls within a call center, using the information entered by the customer on the phone keypad in the touchtone mode. 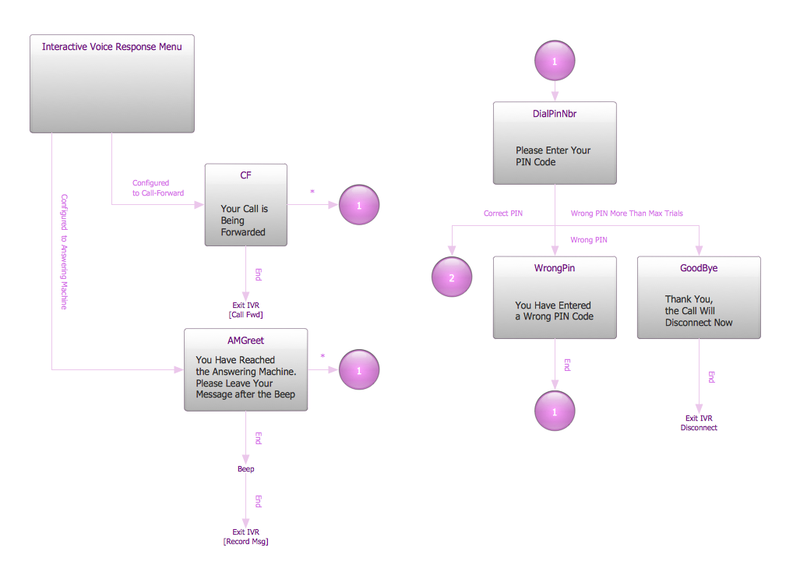 This example was created in ConceptDraw DIAGRAM v12 using the Computer and Networks Area of ConceptDraw Solution Park and show the Interactive Voice Response (IVR) network. How to represent the Interactive Voice Response System? The commonly used way is to draw the IVR diagram. You can draw it manually in a graphic editor, but ConceptDraw DIAGRAM v12 diagramming and vector drawing software offers you the more effective way - to use the powerful tools of the Interactive Voice Response Diagrams Solution for ConceptDraw Solution Park.